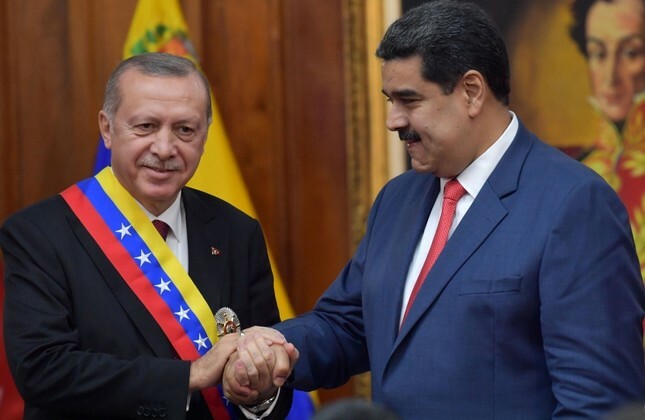 Turkey has started working on plans to build a mosque in Caracas after a request from Venezuelan authorities, President Recep Tayyip Erdoğan said late Monday during a press conference with his counterpart Nicolas Maduro. “Upon a request by Venezuelan authorities, we have started our work to build a mosque in capital Caracas, and we are looking for a suitable area to build it,” Erdoğan said. Praising the Latin American country and its leader for their hospitality, and especially Maduro’s stance for the Palestinian cause, Erdoğan added that Turkey wants to develop its relations with the country in all fields including cultural, business and diplomatic relations. The president is currently on an official Latin America tour, following the G-20 summit in Argentina. Erdoğan also said Turkey sees Venezuela as a partner in Latin America and the Caribbean, and attaches great importance to cooperation and friendship. Yesterday, Erdoğan also visited the Simon Bolivar Mausoleum.